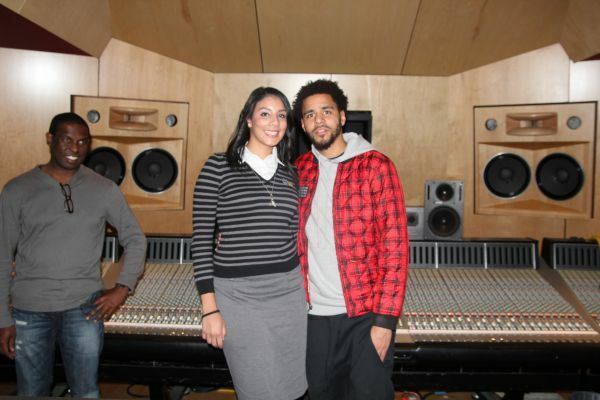 I had the pleasure of being invited to a private listening party for J. Cole’s new album 2014 Forest Hills Drive. After a two hour delay he entered the room and shook everyone’s hand inquiring how we (a select group of 12 media, music, and press professionals) were doing. I don’t know why, but I was already impressed by how personable he was. Before he started playing the first song of his new album, he gave us a brief synopsis of his personal and musical journey. He was born in Germany, where I grew up by the way I already knew him and I had a deeper connection lol. Anyways, when his dad was stationed back in the U.S. they lived on the local base in NC, where they enjoyed a middle-class and tax free life. His perfect world came crashing down when his mom and dad separated, forcing them to live on a trailer park. In his new environment it became evident that he was different from the other kids, not just due to his lighter complexion. He literally said: “I realized the other kids were a lot realer than me”. As a kid he used to ride around his bike all around the city but he always avoided one particular street. We found out later on that the street he always avoided as a kid was Forest Hills Drive. It was in that beautiful house on 2014 Forest Hills Drive he experienced family live again, after his mother remarried and discover his love for hip hop and rap music. Off to college he continued pursuing his passion of basketball (even though he never made the team) and rap music. Things at home on the other hand started crumbling down. His mom and step dad separated and they lost the beautiful house on 2014 Forest Hills Drive. When he came home from college he would would check on his old house and see who would live there. J. Cole also shared with us that he put lots of work into his mix-tapes and even though things didn’t work out for him immediately he knew in his heart that he would make it and was destined for greatness one day. Once he made as Roc Nation’s first signed artist, he became so focused topping his previous accomplishments that he couldn’t even enjoy and take in his success. On top of not being happy with his situation the Record Label tried to make him sound more “commercial”. Work Out was the single he hated the most. Who would have thought that one of his most played records on the radio was the single he liked the least? He found himself in an unhappy place and realized that egos and power play a significant role in the industry, causing unnecessary friction and conflicts among rap artists. After playing us 3 or 4 songs he shared with us that he started reading the Alchemist, one of my favorite books personally. It’s a great motivational book by Paulo Coelho, that treats the issue of making dreams come true and the evolving process associated with it. 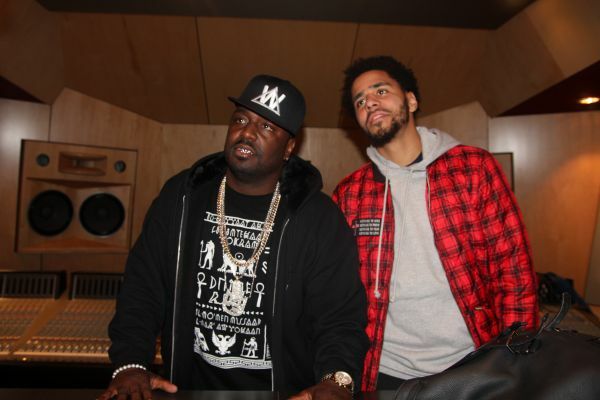 Jermaine started refocusing on the core things in his life. He began appreciating the most important things in life such as his health, family, girlfriend, talent, etc. He learned more about the most high through his life experiences than through the church or the bible. He seemed very spiritual without being religious. He is a great story teller and paints vivid pictures when talking. He described his journey as follows: “I was trying to look over the fence growing up, I eventually made it over the fence, and peers were looking over to me, I didn’t like this side of the fence too much and therefore went back over to the other side of the fence.” That directly correlates to his verse in “Love Yourz” “the good news is … you came a long way, the bad news is … you came the wrong way”. This talented rapper also speaks out on the injustice and racial issues around the world. His honesty and humility were so very refreshing. He wanted Jazz music to be the inspiration for this album, but after visiting iTunes he was shocked to find more white than black Jazz musicians. He couldn’t believe that the ones who actually founded Jazz music wouldn’t receive as much exposure, recognition, and visibility as their white counterparts. After we heard Fire Squad, he clarified that he idolized Eminem, to him he is one of the best rappers alive but as with Jazz he has to be aware that he might never receive the same attention and exposure as his white counterparts. Growing up in Europe I can only attest that even HipHip playing radio stations would barely play black artists but would have white Artists’ records on replay. This album is ALL J.Cole he pitched himself up and down, female vocals are the only elements not originating from the rapper himself. He doesn’t really want to release a single, since one song leads to another and follows a chronological order. The only single he may release is “No Role Modelz”, but I can’t guarantee that as J.Cole isn’t taking the traditional route when it comes to promoting his new album 2014 Forest Hills Drive. He might even release a completely different song. I like that he builds excitement about his album as a whole not just one single. I can’t remember an artist showing up at fans’ houses or inviting fans to their private home to present an album. Well, J.Cole did that!!! He’s taking a very personal way of promotion in order to reconnect with fans. This approach makes him not only appear as a REAL person but also extremely relate-able. I could see the excitement in his eyes when he told us that he has never owned any property and finally bought back his old house this year. He has gained great confidence in his skills as an artist that he couldn’t care less about worldly standards, praise and recognition. J. Cole is my favorite rapper and you guys can only imagine how excited I was to have the chance to listen to his personal story, interact with him, and ask him questions. One of my top 10 moments in my life so far. I was glad to listen to real music again that isn’t considered old school. I’m honestly sick of all the new rappers talking about the same things, without any substance behind their lyrics. Thank you J.Cole for finding back to your original sound and producing another dope album! Previous What to get him/her for Christmas?? ?